If the natural shape of your nose is making you unhappy, impeding your quality of life, or if your nose is misshapen because of an accident or injury, discussing your situation with Dr. Brent of Moelleken Plastic Surgery is the first step, as he will give you a good idea about what can and cannot be done to help you. 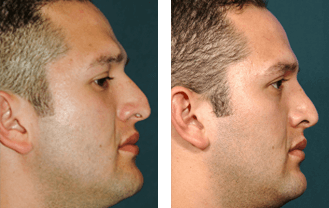 He pays close attention to aesthetic concerns to avoid a “one size fits all” approach to nose reshaping and he also specializes in reconstruction of the nose after trauma or the removal of cancer. Dr. Moelleken is an Attending Surgeon in the Division of Plastic and Reconstructive Surgery at UCLA, where he often performs surgeries and teaches residents. He specializes in patients diagnosed with skin cancers in the facial area who require complex, artful reconstructions. His greatest joy is returning them to a normal life and appearance after they have survived such devastating trauma. Dr. Moelleken believes that art and perspective comprise 30% of the surgical equation, while the other 70% come from unhurried, compassionate surgical judgment, knowledge, and technique. His patients range from every walk of life including schoolteachers, architects, celebrities, company presidents, and foreign dignitaries to name a few. He individualizes his surgical approach with each patient and when you meet with Dr. Moelleken, you will receive a surgical plan that is highly customized to your individual needs. Dr. Moelleken performs all surgical consultations himself and he believes that all new procedures should pass the test of respected peer reviewed publications to be considered legitimate. He encourages patients to seek several consultations and research potential physicians thoroughly before deciding on the right plastic surgeon. Dr. Moelleken feels it takes a strong surgeon to say “no” if plastic surgery is not the right answer. He quotes, “We have a saying in plastic surgery that you make your money on the patients that you operate on but you make your reputation on the patients you do not operate on and I think that is very true.” He believes a reputable surgeon with a good practice should be honest with his patients by telling them if the surgery they are considering is in their best interest or not. He says that it is his philosophy to take someone’s nose and say, “What’s the best nose that we can make for this person?” He will not take someone else’s nose and put it on a patient if the structure is not built for them. The exact appearance of your nose cannot be determined before the surgery is completed. A patient cannot expect to be able to select a particular nose since changes are limited by such factors as skin and bone thickness, nostril size, and general facial configuration. In general, Dr. Moelleken’s surgical and aesthetic judgment must be trusted and together you will work to decide the most beneficial procedure based on your personal nasal anatomy. It is a well-known fact that Rhinoplasty is one of the most complex cosmetic surgery operations performed today and some of the top board certified plastic surgeons choose to refer their patients to specialists instead of performing the procedure themselves. What may seem a simple hump removal or tip refinement is often a series of very precise surgical maneuvers that can easily be over or under-corrected by a novice plastic surgeon. 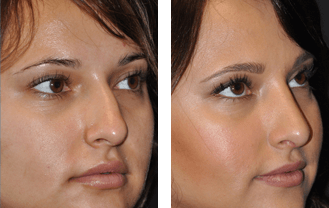 Rhinoplasty is an operation of millimeters or fractions and it is a three dimensional cosmetic surgery that can affect the most important function of the nose – breathing. It is an operation that takes the utmost skill, artistry, and a complete comprehension of the nasal anatomy and Dr. Moelleken excels in all categories. If you feel you are a good candidate for rhinoplasty or you want to learn more about the procedure, please call Neo Surgery Center today to schedule your initial rhinoplasty consultation. When many men, women, and young adults are asked what they do not like about themselves, the answer is their nose. They say they are unhappy with a bump, the length, the shape, or the breathing problems they experience. There are so many unknowns about rhinoplasty that if you are considering the procedure, it is crucial to understand all of the many facts involved. Your nose is the center of your face and choosing an experienced doctor is the first priority because experience counts. Dr. Brent Moelleken, M.D., F.A.C.S. is a Plastic and Reconstructive surgeon practicing in Beverly Hills and Santa Barbara, California. Double board certified, he received his training at Harvard University, Yale University, UCSF and UCLA. Dr. Moelleken is one of three specialty-trained surgeons in the world to complete the year-long Aesthetic Surgery Fellowship at UCLA. Dr. Moelleken says every doctor has his own style so the first thing you should do when considering any cosmetic procedure is to check credentials and make sure the doctor is board certified. He says to also make sure the doctor has a hospital that he can do the surgery at instead of just working solely out of his own office because that can be an indication that the doctor is not very well trained. During your consultation, you want to determine what the plans are for your nose and to do this you should define ahead of time what it is about your nose that bothers you. If it is about breathing, Dr. Moelleken will ask you if your breathing is worse when you exercise and if it improves when you are taking decongestants. Dr. Moelleken is concerned about every aspect of your nose: not just the appearance. He says it is very important that a nose is able to smell and changing the physical and external appearance is extremely multi-faceted. Dr. Moelleken warns that many people who are board certified cosmetic surgeons might not actually be plastic surgeons. He explains that when you are having your nose operated on, you should choose a doctor that is trained in plastic surgery of the ear, nose, and throat because the internal structure of your nose is just as important as the outside appearance; in fact, it may be the same. When you have problems corrected such as a deviated septum, which makes breathing easier on the inside, it can actually make your nose look better on the outside too.